Note from David: The reason we share this is not because we trust in guns or need them, but the sign they are of the coming genocide and Civil War. Below is an excerpt from my book Phoenix Rising, chapter 15, warning that eventually the government will impose gun control as we move toward a more totalitarian state. But according to today's Living Constitution ideology, these types of freedoms are being slowly eroded from the people, only to eventually be completely seized through some national emergency. Please know and take these words to heart, when you no longer have the right to bear arms you will no longer have your freedom. The first thing that a dictatorship does is have the citizens register their weapons. Then they take away those weapons from those law abiding citizens. You don't have to own a weapon, but as soon as you force everyone in the nation to give up their guns you stand on the brink of a police state. History consistently demonstrates this scenario to be true. Consider the following information from the book "Lethal Laws" by Jay Simkin & Alan M. Rice. The list is sorted by the date the gun control laws were enacted, the government that established those laws and the genocide that occurred shortly afterwards. 1911 Turkey - 1915-1917, 1.5 million Armenians killed. 1929 Soviet Union - 1929 to 1953, approximately 20 million dissidents killed. 1935 China - 1948 to 1952, 20 million political dissidents killed. 1938 Germany -1939 to 1945, 6 million Jews and countless others were exterminated. (Some estimate 11 million deaths). 1956 Cambodia - 1975 to 1977, one million "educated" people were exterminated by Pol Pot's Khmer Rouge. 1964 Guatemala - 1964 to 1981, 100,000 Mayan Indians killed. 1970 Uganda - 1971 to 1979, 300,000 Christians killed. 1990s Rwanda - During 1994, 800,000 Christian Tutsis were systemically massacred by the government-led Hutu military forces. It has been estimated that the number of registered handguns in this country is 70 million, and the number of unregistered is 50 million. In comparison, the U.S. Army only has a small arms inventory of about 4.8 million guns. As you can see, before any government could take absolute control of the American citizenry these weapons need to be seized as history has continuously substantiated. One of the methods that have been used to reduce the arms among the citizens is of course propaganda. Studies have found that guests on morning and evening news-talk shows are more likely to represent a pro-gun-control position by a ratio of 5:1 to 10:1. During the debate over the Brady Bill research conducted by the Media Research Institute found that 59% of the network reports were "anti-gun" and that only 4% could be considered "pro-gun". Further, spokesmen in favor of the Brady Bill outnumbered opponents on the four major news networks (ABC, CBS, NBC, CNN) by a ratio of three to one. But taking handguns off the streets will make the world safer, or at least, that is what the Newspeak media would like for us to believe. Consider what occurred in Australia in 1996 when they banned private handguns in the name of public safety. After the citizens turned in their handguns there were increases of homicides by 3.2 %, assaults by 8.6 %, and robberies by 45%. In the Australian state of Victoria, gun homicides have climbed 300%. 25 years prior to the gun bans, crime in Australia had been dropping steadily. England followed suite in 1997. In May of 2004, the British government reported that gun crime in England and Wales nearly doubled in the last four years. Serious violent crime rates from 1997 to 2002 averaged 29% higher than 1996 and showed increases in robbery by 24%, and murders by 27%. The violent crime rate in Australia and England is now double what is in the United States. Thomas Jefferson fearing the oppressive governments and being a student of history warned Americans against ever giving up this right. In the second major front in the war over gun rights that has developed in just days, a lawsuit has been filed against U.S. Attorney General Eric Holder seeking a court order that the federal government stay out of the way of Montana's management of its own firearms. The action was filed by the Second Amendment Foundation and the Montana Shooting Sports Association in U.S. District Court in Missoula, Mont., to validate the principles and terms of the Montana Firearms Freedom Act, which took effect today. WND previously reported on the precedent-setting move taken over the course of recent months when the 2009 Montana Legislature approved the bill and the plan was signed into law by Montana Gov. Brian Schweitzer. The law provides guns and ammo made, sold and used in Montana would not require any federal forms; silencers made and sold in Montana would be fully legal and not registered; and there would be no firearm registration, serial numbers, criminal records check, waiting periods or paperwork required. The idea is spreading quickly. Tennessee already has a similar law, and similar plans have been introduced in many other states. The move comes at a time the nation has a president who has placed anti-gun activists in several influential positions, including an attorney general who supported a complete handgun ban in the District of Columbia before the U.S. Supreme Court threw it out. Montana's plan is called "An Act exempting from federal regulation under the Commerce Clause of the Constitution of the United States a firearm, a firearm accessory, or ammunition manufactured and retained in Montana". "The guaranty of those powers is a matter of contract between the state and people of Montana and the United States as of the time that the compact with the United States was agreed upon and adopted by Montana and the United States in 1889", the law states. The lead attorney for the plaintiffs' litigation team is Quentin Rhodes of the Missoula firm of Sullivan, Tabaracci & Rhoades, PC. The team includes other attorneys working in Montana, New York, Florida, Arizona and Washington. "We're happy to join this lawsuit", said Alan Gottlieb, founder of the SAF, "because we believe this issue should be decided by the courts. "We feel very strongly that the federal government has gone way too far in attempting to regulate a lot of activity that occurs only in-state", added MSSA President Gary Marbut. 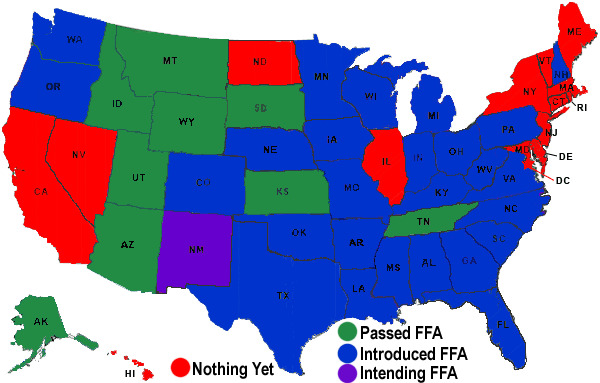 "The Montana Legislature and governor agreed with us by enacting the MFFA. We welcome the support of many other states that are stepping up to the plate with their own firearms freedom acts". David Codrea, a Gun Rights Examiner writer, noted the federal government already has started attacking the move. "What if an FFL was not acting in his capacity as a federal licensee to manufacture for personal use, or to transfer firearms strictly within a state? Or what if a person so engaged was not a federal licensee at all?" Codrea asked. Then he answered: "ATF's determined intent to hold all accountable under federal law has not wavered. In a letter to MSSA president Gary Marbut, Richard Chase, Special Agent in Charge, Denver Field Division, states: 'The manufacture of firearms or ammunition for sale to others within Montana requires licensure by ATF'". In a statement the SAF said, "The primary purpose of the MFFA is to set up a legal challenge to federal power under the commerce clause". The lawsuit seeks a "declaratory judgment" and is "brought for the purpose of determining a question of actual controversy between the parties". "Passage of the MFFA was an express exercise by the State of Montana of powers reserved to the states and to the people under the 10th Amendment of the United States Constitution", the lawsuit said. "The MFFA is also authorized under the conditions of the compact with the United States that Montana entered upon admission to the union. The United States Congress therefore has no authority, under the limited powers granted to it by the United States Constitution, to preempt the MFFA". The arguments continued, "Under the 10th Amendment, all regulatory authority of all such activities within Montana's political borders is left in the sole discretion of Montana. Federal law therefore does not preempt the MFFA and cannot be invoked to regulate or prosecute Montana citizens acting in compliance with the MFFA, so long as they do so solely within the political borders of Montana". WND also reported this week on a second front in the battle over guns when the Supreme Court agreed to hear a landmark Second Amendment case challenging Chicago's ban on handguns and onerous registration procedures on other firearms. The Illinois State Rifle Association and the Second Amendment Foundation filed a lawsuit against the city of Chicago claiming the city enforces a handgun ban identical to the one struck down by the Supreme Court in the case District of Columbia v. Heller and that the ban violates residents' Second Amendment rights. In Heller, the court rejected a lower court position that claimed the Second Amendment applied only to state "militia", such as the National Guard. However, the 5-4 ruling referenced the federal jurisdiction of Washington, D.C., and not states and localities. This case, McDonald v. Chicago, challenges a 7th Circuit court ruling that said the Second Amendment applies only to federal regulation of an individual's right to guns and not in cases of restrictions by states and municipalities like Chicago and Oak Park, Ill. The Second Amendment to the U.S. Constitution states: "A well-regulated Militia, being necessary to the security of a free State, the right of the people to keep and bear Arms, shall not be infringed". The plaintiffs argue that "the right of the people to keep and bear arms" in the Second Amendment is "incorporated" into the 14th Amendment and applies to both states and localities. NEW YORK - If lawmakers and authorities are truly concerned about stopping gun violence in schools, they need to take a close look at the prescription of psychotropic drugs for children and young people, says a leading psychiatrist. Psychotropic drugs "prescribed for school children cause violent behavior", Healy stated. "The pharmaceutical companies made these drugs with the idea of making money", he said. "There's a wide range of problems when it comes to looking at these drugs for children. Very few children have serious problems that warrant treatment with pills that have the risks SSRI drugs have". The drugs can make children "aggressive and hostile", he noted. "Children taking SSRI drugs are more likely to harm or to injure other children at school", said Healy. "The child may be made suicidal. "We are giving drugs to children who are passing through critical development stages, and as a society we are really conducting a vast experiment and no one really knows what the outcome of that will be". "When roughly nine out of every 10 cases in these school shootings and mass shootings involve these drugs being prescribed, then at least a significant proportion of these cases were either caused by the drugs or the drugs made a significant contribution to the problem", he said. "You can draw a line between the number of child psychiatrists in the United States and the number of school shootings, and you will find that both have gone up in the same direction at the same time", he said. He sees a "propaganda campaign" being conducted in the U.S. in the wake of the Aurora, Colo., cinema shooting and the Newtown, Conn., school shooting asserting gun violence is being caused by mental illness and could be stopped by additional school programs that screen for it. "If school children are screened for mental illness problems, this presumably will lead more medical doctors to put more students on more pills", he said. "I would predict then the outcome of more school screenings for mental illness will be more mass killings, even if the guns are taken away and the mass killings are not done with guns". He cautioned shareholders of pharmaceutical companies to realize share prices can be adversely affected should judges and juries determine the companies bear legal liabilities. Law enforcement investigators could conclude one of the company's medications was prescribed to a child who ended up perpetrating a school shooting. "Market research, for instance, has made pharmaceutical companies realize it is much harder to sell drugs for Attention Deficit Hyperactivity Disorder, ADHD, in a home or a community where the child's grandmother is likely to be present", he explained. "Because, of course, the grandmother may say, 'That kid doesn't need pills. His father was just like him, and look, his father turned out alright'. Medicine intervenes with pills when communities have lost their roots in families". To solve this problem, Healy has created a website, RxISK.org, that allows the posting of personal experiences with SSRI drugs by people who have had personal experience or have had partners, parents, children or friends injured by them. These are people, the website says, "who have found themselves trapped in a Kafkaesque world when they have sought help from doctors, regulators, or others who seem to be there to help us"
Hitler took up guns before slaughtering the Jews and many others and he was popularly voted into office. Also read Guns to Be Taken.